This 10.3-mile multi-use trail system is the result of a successful partnership between the City of Carlyle and the U.S. Army Corps of Engineers, Carlyle Lake Project. The trail connects the City of Carlyle to Carlyle Lake. It extends through diverse and scenic wildlife habitat providing bicyclists, runners and walkers a one-of-a-kind look at nature. The trail provides unique historical and interpretive points of interest to enjoy along the way including the Carlyle Lake Dam, General Dean Bridge, Goshen Trail, restored prairie, and wetland areas. Location: On U.S. Army Corps of Engineers Managed public lands at the Carlyle Lake Project and the City of Carlyle, IL. 50 miles east of St. Louis MO. Carlyle Lake is located on the Kaskaskia River at river mile 94.2 upstream from it's confluence with the Mississippi River and about one-half mile upstream of the town of Carlyle Illinois. 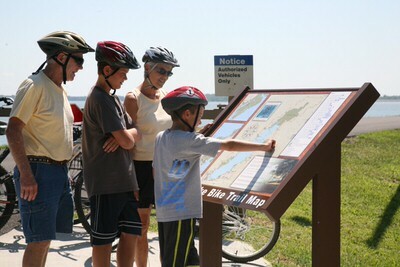 The trail head of the Carlyle Lake Multi-Use Trail is located in the Dam West Recreation Area at Carlyle Lake. 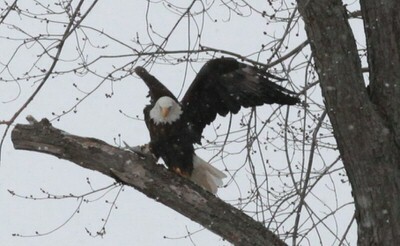 Approximately 50 miles east of St. Louis, Missouri, On U.S. Highway 50. The project area is bounded by Interstate Highway to 70 on the north, U.S. Highway 50 and Interstate 64 on the south, U.S. Highway 51 and Interstate 57 on the east, and Illinois State Route 127 on the west. The Carlyle Lake Multi-Use Trail is a 10.3 mile trail that is unique because of its close proximity to the City of Carlyle allowing a connection route between the City and the U.S. Army Corps of Engineers Carlyle Lake Project. The trail is the perfect venue for fitness based recreational activities and has one of the most scenic views in Clinton County. The trail is open to non-motorized use such as walking, running, and bicycling and is generally flat offering an easy ride for all skill levels. The trail is well marked and signed to provide an overall safe experience for those recreating on the trail. The Carlyle Lake Multi-Use Trail was constructed over a period of years through a series of Challenge Partnership Agreements between the City of Carlyle and the U.S. Army Corps of Engineers including funds through the Corps of Engineers Handshake Grant program and a grant from the Illinois Department of Transportation. 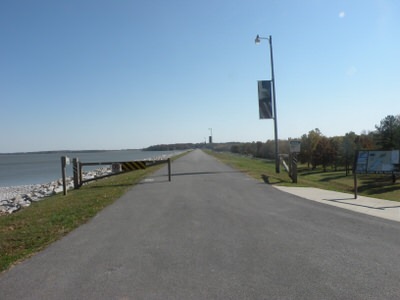 The multi-use trail includes just under a mile of trail located on City of Carlyle property and connects with the remaining 9.43 miles of trail located on U.S. Army Corps of Engineers property. The connection routes between the City of Carlyle and the Carlyle Lake Project are invaluable to local citizens and to the 3.2 million lake visitors as a way to stay fit and maintain a healthier lifestyle and provides a positive economic impact to area businesses. The trail travels to areas flourishing with historical landmarks and various habitats ranging from lake, forested, agricultural fields, restored prairie, and wetland restoration areas. The surfaces of the trail are a combination of asphalt, concrete, and crushed rock. Seven miles of the multi-use trail travels over earthen levees giving users a unique elevated view of the scenic landscape. 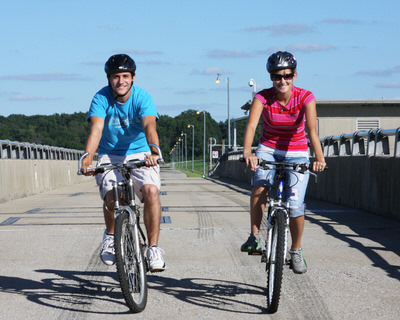 The Kaskaskia River Walk, a 1.3 mile section of the multi-use trail located below the Carlyle Lake Main Dam, allows users to travel along the Kaskaskia River. In 2011, a pedestrian bridge was constructed and placed across the old Kaskaskia River channel. The bridge is an integral part of the trail system allowing visitors a connection route from the east and west side of the river. 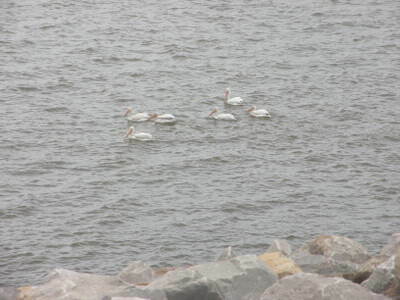 This section of the trail is well known for its watchable wildlife and fishing opportunities. 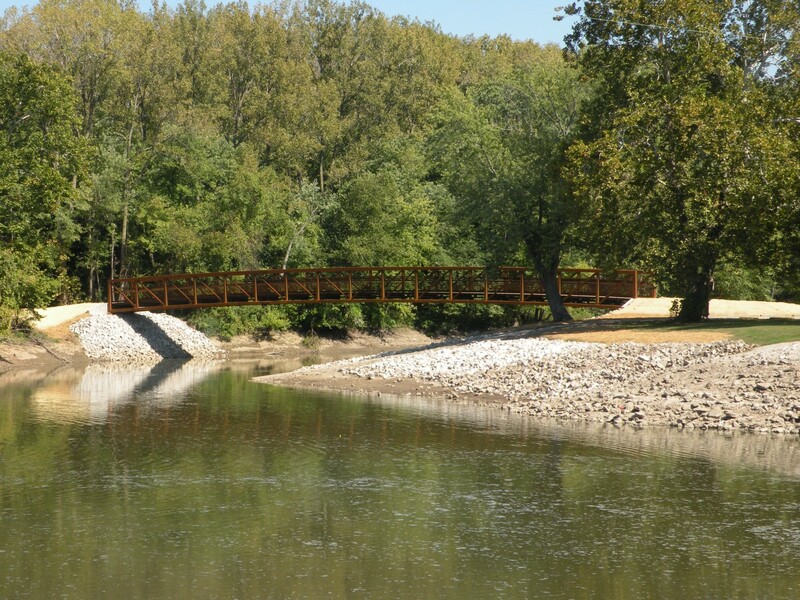 Another key aspect of the Kaskaskia River Walk is that it is rich in historic significance. Trail users have the opportunity to travel across the historic General Dean Suspension Bridge constructed in 1859 and named after Major General William F. Dean a native of Carlyle who served in the Korean War. Prior to construction of the bridge travelers were forced to cross the Kaskaskia River by ferry or using a mud bridge. 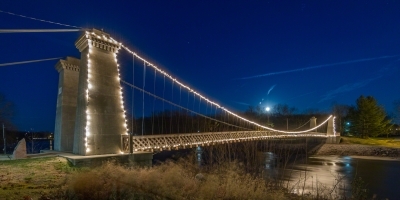 The General Dean Suspension Bridge is listed on the National Register of Historical Places. As users travel across the General Dean Suspension Bridge they are also roaming over a section of the Goshen Trail much as the bison, Native Americans, and settlers did many years ago. The Goshen Trail stretches through southwestern Illinois parallel to the General Dean Suspension Bridge. Interpretive displays along the Kaskaskia River Walk provide users an educational experience and a glimpse back in history. The multi-use trail passes through numerous recreation areas including Dam West, Dam East, McNair and South Shore State Park Recreation Areas that provide users opportunities to camp, boat, swim, and fish. At the southern end of the trail, visitors can enjoy dining and entertainment in the City of Carlyle. 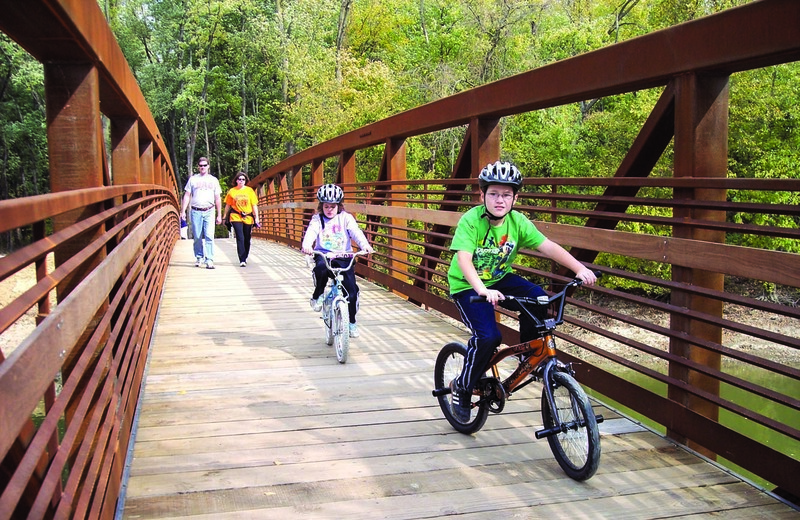 In 2010, through an Illinois Department of Resources Greenways, and Trails planning grant the U.S. Army Corps of Engineer and the City of Carlyle worked jointly to investigate and determine the most suitable and appropriate routes to circumnavigate Carlyle Lake. A plan was created to identify additional segments that will be completed in the future to broaden and enhance the Carlyle Lake Multi-Use trail system. Throughout the past several years, numerous organizations have held events including: bike rides, 5K's, triathlons, and marathons on the multi-use trail system. The multi-use trail helps to support the President and First Lady's challenge to improve overall fitness by promoting a healthy and active lifestyle through these events. Since the development of the Carlyle Lake Multi-Use Trail a significant increase in walkers, runners and bicyclist at the Carlyle Lake Project, has been reported. Buddy Walk – occurs annually in April with approximately 300 participates. The event is hosted by Community Link of Breese Illinois and takes place in the Dam West Day Use Area. The event consists of a one-mile walk to support local at-risk families and individuals living with Down Syndrome in Clinton and surrounding counties. Gateway Triathlon – occurs in May with approximately 350 participants. The triathlon consisting of swimming, cycling and running and take place in the Dam West Day Use. The event is hosted by 1863 Events. Dare Bike Ride –occurs in September with approximately 250 participants. The event consist of a 11, 25, 50, 62, and 100 mile ride that utilizes the main dam and saddle dam II and III sections of the multi-use trail. The event is hosted by the Trenton, Illinois Police Department to support a Dare Scholarship program. Jason “Red” Memorial 5K Run/Walk – occurs annually in October with approximately 200 participants walking or running across the Main Dam and Saddle Dam II. All proceeds benefiting the Hal Hempen Memorial Foundation and Lebanon High School scholarship fund. 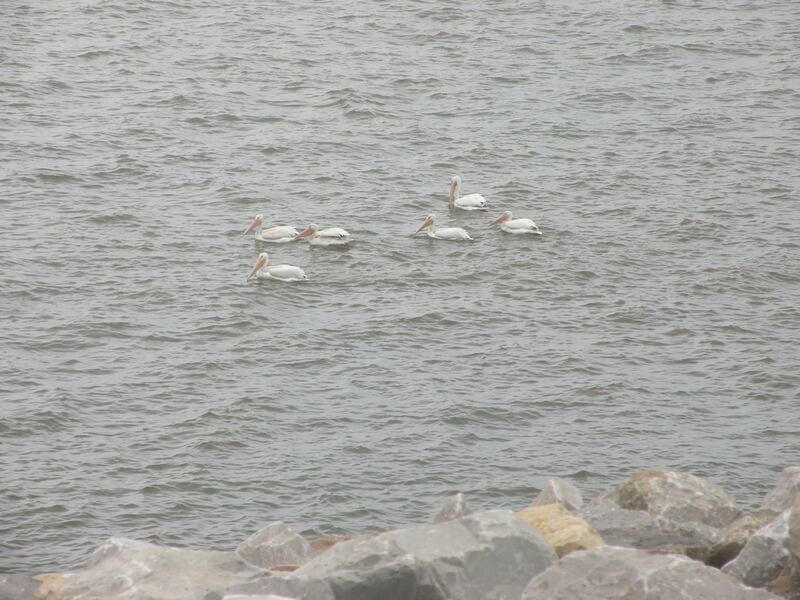 White pelicans located on Carlyle Lake. Old Kaskaskia River Channel Pedestrian Bridge. A family watching the Bald Eagle and white pelecans. Moonlit General Dean Bridge. Photo by Jeffrey M. Smith.